Linda & Patrick, proprietors at Cracker P's. 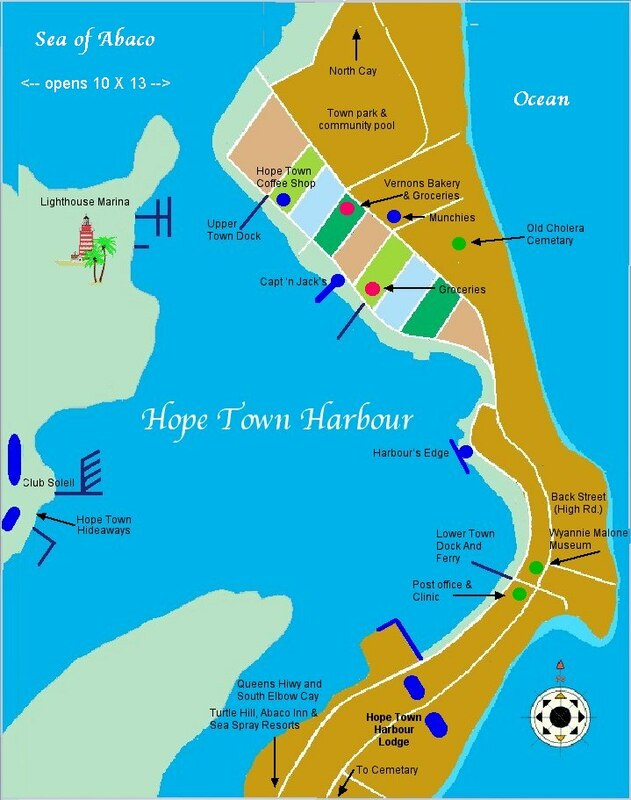 Elbow Cay (Map) is often thought of by the name of its quaint village of Hope Town (Map). Ironically, three of Elbow Cays' resorts and many of the islands new homes reside south of town in the area at White Sound and beyond. 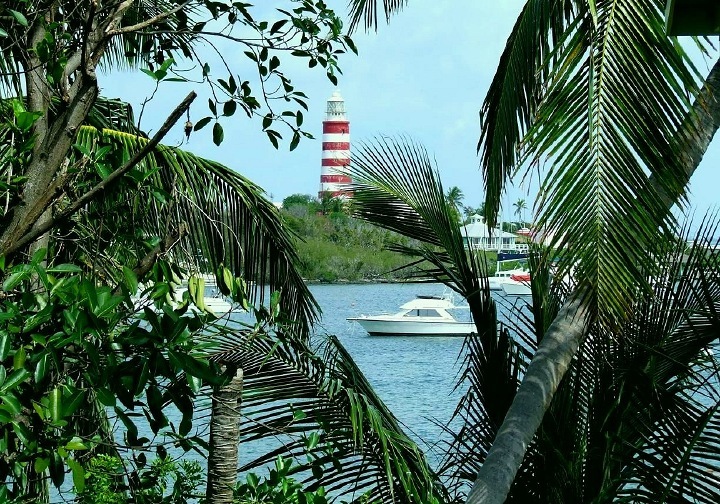 On the west side of Hope Town Harbour you will see Abaco's main attraction, their famous Candy Striped Lighthouse.! It is the last hand wound kerosine fired, manually wound lighthouse of its type in the world. It's seen in many of the Bahamian tourist brochures. 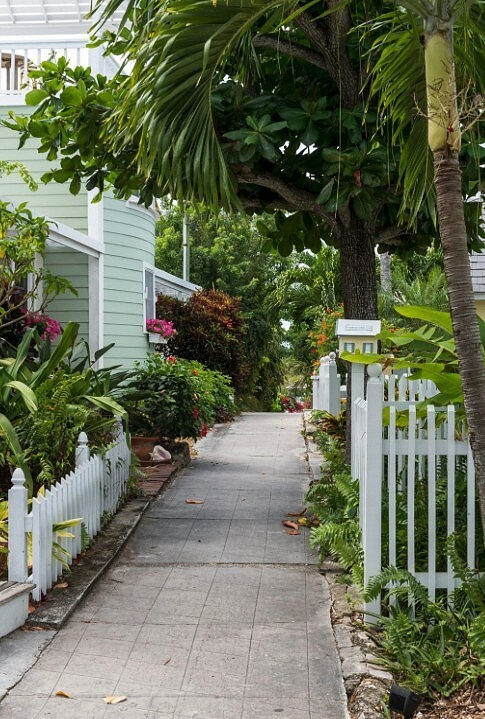 This area is described as the most photographed in all of the Bahamas and we concur. It is a photographers delight, from the lighthouse to its brightly painted houses all punctuated with flowering shrubs and plants. 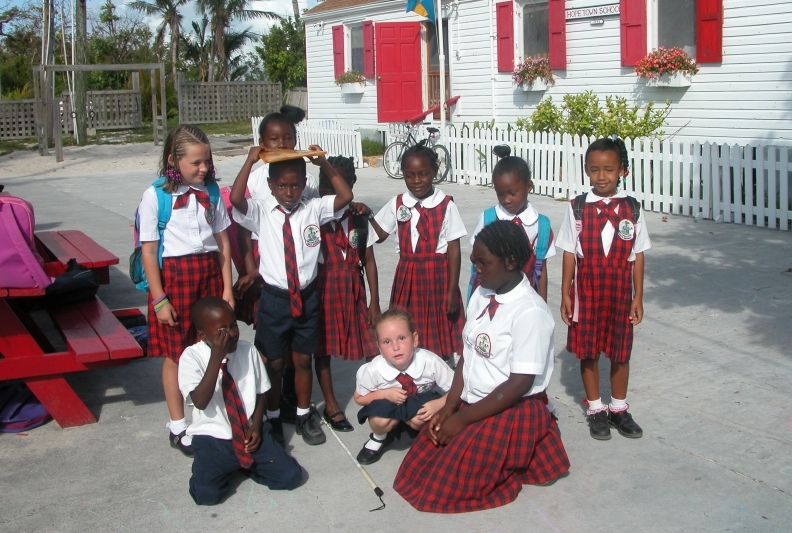 A video on Bahamian Lighthouses can be found here. Note: Hope Town's Lighthouse is only accessible by boat. Another reason to rent a boat. If you don't have a boat at your disposal, head down to one of the town dock and ask for a ride. Someone is usually heading out and will drop you off as they pass by. Even the ferry will drop you off for free but you might have to hitch a ride back. It's only a 5 minute ride and a trip to the top is worthwhile and free, so make the effort and bring your camera. When in Hope Town a must see experience is a visit to the Wyannie Malone Historical Museum. Here you'll step back to earlier times in this island settlement surrounded by artifacts of a bygone era. Check first to be sure they are open as their hours are irregular. In Hope Town, island life surrounds the harbour which has a narrow and shallow opening for the many visiting yachtsmen. As you would expect there are a couple grocery stores, gift shops and a liquor store. Vernon's grocery and bakery is the oldest. Be sure to stop by for one of his homemade pies. Buy the way, Vernon moonlights as the town's justice of the peace and minister. 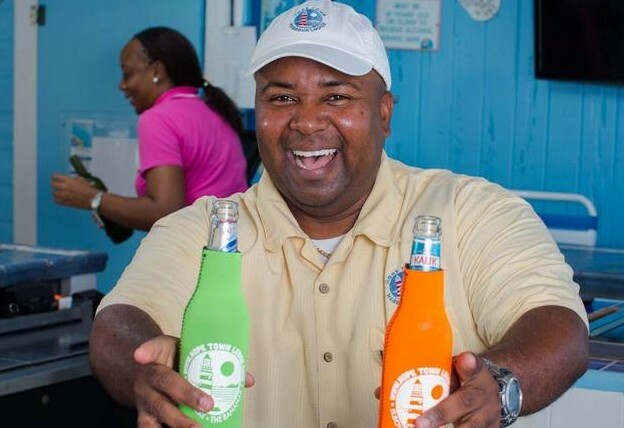 Weddings are big business on the Cays and in Hope Town, Vernon is the main Man. Fact is he married us! We were number 618. He definitely qualifies for an Abaconian "Character" award. You'll see him about for sure. If you can't rent a boat, consider renting a golf cart for getting about for island exploration. The newest on Elbow Cay is owned by one of the cays "Nine Sisters" and that be Wilma at Elbow Cay Cart Rentals. 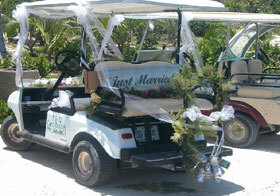 A couple others that come to mind are Island Cart Rentals and T & N Cart Rentals (Wanda at 366-0069). All are often booked during peak periods, so plan ahead. For adventures of all types stop by Froggie's. They are next to the main town dock. They offer snorkeling and dive trips with or without lunch at a neighboring island restaurant. In addition they offer all sorts of out door adventures, hiking, kaiaking etc. It's time we define resort in the Abacos: A resort includes hotel and or rental villas with bar(s), restaurant(s), pool, beach, and marina . Some times the marina, or beach is optional but near by. In the village of Hope Town there is one resort, The Hope Town Harbour Lodge. It is on the southern edge of town. It has a lovely reef for the beginner snorkeler right in front of the Lodge. Add to that their ever popular pool bar and you've got a fun place to spend the day. At the Lodge, lunch is served on the patio deck pool side and dinner in their "Great Harbour Room" restaurant, with breakfast at both. The Lodge's, restaurant is the finest on the island (casual dress). It is where we had our wedding reception in '07 when one was allowed to smoke cigars in "Rays Place", the Lodge's bar. The Lodge has no marina, just a dock for bow in parking of small boats - 24' or less for guests and visitors. The ferry stops in front of the dock, so dock your boat on the side. The Lodge offers cottages, pool side cabanas and of course rooms in their main building. Just up the "upper road" from the Lodge is the school house. It's so cute to see the children going past all dressed in their tidy uniforms. Too bad we don't have that in the States. Keep on going and you will arrive at the cemetery which has been undergoing restoration the last few years. The epitaphs are worth a read. Throughout Hope Town and Elbow Cay there are numerous rental homes, one that comes to mind is, Calypso - the proprietor of which graciously provides us folks with a Webcam. 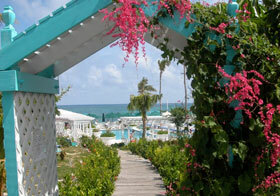 The home is especially suited for large families or a Hope Town Wedding. It's just south of town right on the ocean and minutes away from your dock on Nigh Creek. What's more, the home provides immunity from such dubious out island inconveniences as routine power outages with a house full of guests. If you like activity, you might want to check out The Hope Town Villas right at the harbour entrance where you can see all the comings and goings. You can even wave to your friends on the ferry before they put a foot on shore. See Accommodations & Services Page for more. A twenty minute walk south of town you'll find The Turtle Hill Villas, An assemblage of 2-3 BR homes for rent. It's also the home of On Da Beach Bar and Restaurant (& Rotisserie), A couple days a week you can order a rotisserie chicken to take home. Just call up in the morning 366-0558 and have a lovely crispy rotisserie chicken ready for you by 6:00. The restaurant/bar, as you'd expect, is right "On Da Beach". On the town side of the harbour, you'll find Captain Jacks restaurant which is right on the water. Here trivia pursuit and bingo are played a couple nights a week for 80% of the pot and free drinks. Their newest event is Walmart Night when everybody dressed in "Walmart clothes" for prizes. Red neck drinks sold. Just down the harbour is the Harbour's Edge, another lively spot. Both have music a couple a nights a week and both are closed one night too. Cruising through Hope Town you'll no doubt noticed the new coffee shop in town, WiFi and all, called appropriately enough the Hope Town Coffee House, and offers fresh baked pastries, quiches and stratas all based on family recipes. 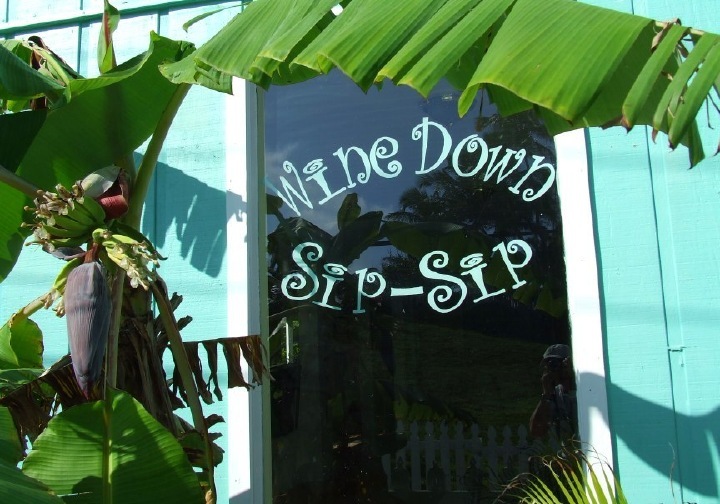 The town's newest spot is, "Sip Sip" - a common term in the Bahamas meaning to Gossip. It's proprietor is Bonnie Hall, preacher Vernon's daughter. Sip Sip is a wine bar that includes after dinner drinks and cordials. No Pina Colada here. If you want a cigar, you have to step out onto the back porch. She's located on the upper road next to the liquor store. The White Sound Area of Elbow Cay lies three miles south of Hope Town where you'll find Elbow Cay's three other resorts. Two lie between White Sound and the Ocean. 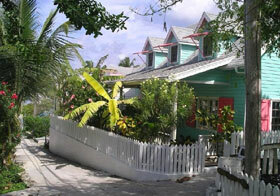 They are, The Abaco Inn, where we stay on alternate trips, and the Sea Spray a short walk beyond. We should mention, this area usually suffers serious damage by passing hurricanes as it did with Floyd then some years later by Jeanne. Just south of the Abaco Inn during both of those storms, the island was cut in half with the opening of a pass between White Sound and the Atlantic Ocean isolating the Sea Spray and the whole south end of the island. The locals, true to form, had the pass filled in, in no time at all. Today there is no sign of the devastation. Fact is things were pretty much rebuilt in time for the next tourist season. Imagine that happening in the US. 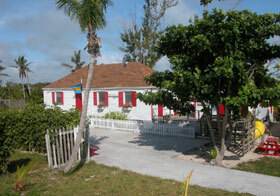 The first resort you'd come to on your southward trek is the Abaco Inn. They are under going some re-modeling and renovations including a new deck facing White Sound adjacent to their bar. They offer ocean front and bay front accommodations. Our Choice has always been Cabin #5. If you go by rental boat, the Inn's bow-in docking facilities will accommodate you, but are limited to a dozen boats under 26 foot. The Abaco Inn's restaurant has an absolutely beautiful view on fair weather days over looking the ocean, beach and pool below their pool below. 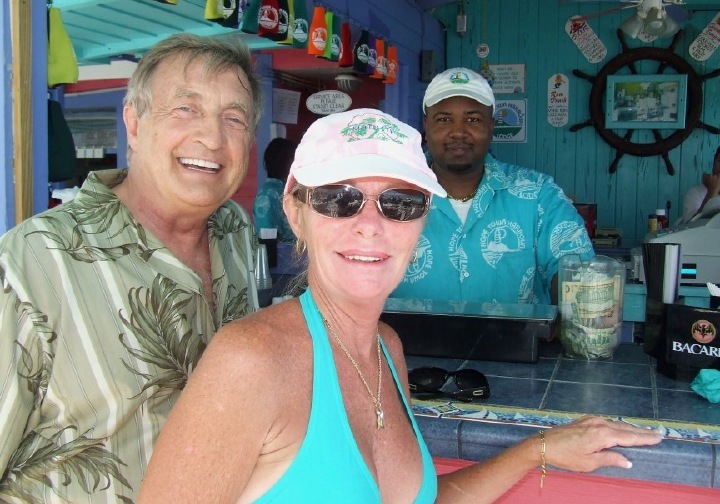 The Abaco Inn's bar is another upbeat spot facing the bay & White Sound. Seems everybody from south island stops by for a drink when passing by cart. Oh, they have music a couple times a week too, As a guest they will run you into Hope Town and back on request. Be sure to say hi to their manager "Tom" when you stop by. At the Abaco Inn, we became engaged in conversation with a couple who turned out to be the simulator trainer of both Gemini and Appolo astronauts. Also as it turned out, the parents of comedian Carrot Top. We stayed in touch and met up with them usually every year. You just never know who you might see or meet in the Abacos. In '07 they stood in for us at our wedding by Preacher Vernon at St. James Church in town. Just a 10 minute walk further south you'll come to the Sea Spray facilities including a large fully equipped marina, with ships store and shop. They offer cottages for rent some of which are on the ocean. They have a lovely pool side restaurant and lively tiki hut bar, all positioned adjacent to the marina. The "Hope Town Islanders" play once a week in season. I'm often asked to compare the The Sea Spray and Abaco Inn. 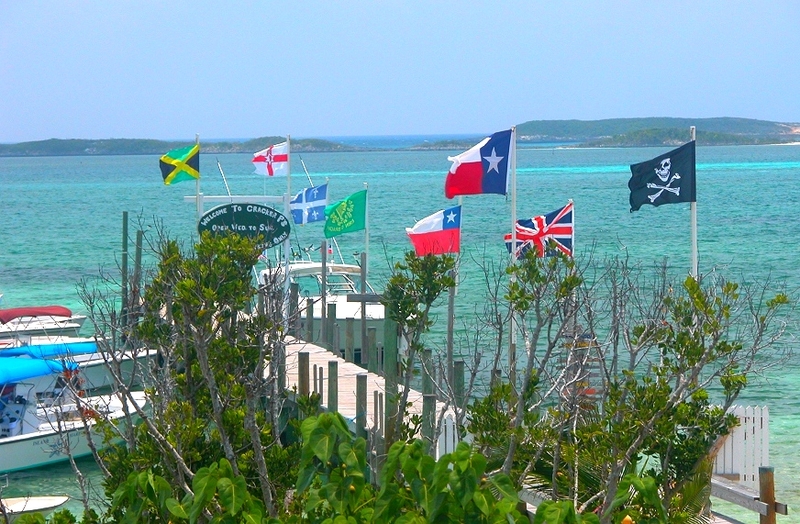 All I can say is, the Abaco Inn restaurant wins the in the best view category but it can sometimes be windy. On the other hand, there is a lot to be said about romantic dining on the marina deck by the Tiki Bar and pool at the Sea Spray. Still, the Tiki bar and restaurant are outside, so weather must be taken into consideration. And in June as the schools let out in the states, the many families that summer on south Elbow seem to congregate at the Sea Spray with children out numbering adults. They have a small inside dining area incase of rain. Both have efficiency Villas and will provide transportation to and from Hope Town even if staying elsewhere. Just north of White Sound on its western corner is Elbow Cay's newest resort, The Firefly Sunset Resort. It faces the Sea of Abaco side of the island and offers two pools, villas and their already popular "Last Light Restaurant" AKA Firefly Bar & Grill. You'll see their sign posted on the ocean road just prior to the Abaco Inn. We hear the Hope Town Hideaways handles their booking. On the southern end of Elbow Cay facing Lubbers Quarters, is a popular spot called Tahiti Beach, (Video) supposedly for its stand of coconut palms many of which were wiped out by hurricanes. It's often crowded but still fun for a day trip by boat. (Golf cart access / parking is limited.) Often you'll see anchored in a couple feet of water just off the sand bar at Tahiti Beach, the "Thirsty Cuda", Elbow Cay's newest and only floating restaurant. It's there pretty much daily when there is a crowd during season and features tropical drinks, beer and light fare of what one might expect in the Bahamas. You’ll just have to get wet to get your Kalik. If you find Tahiti too crowded, head furthure south, as there are many other beaches where you have a better chance to be alone. Note: All three of Abaco's south end resorts provide "gratis on call transportation" to Hope Town and its ferry, shops or restaurants. And this works in reverse. Staying at the Lodge or elsewhere in town they will pick you up in town for dinner or lunch with a swim in their pool. 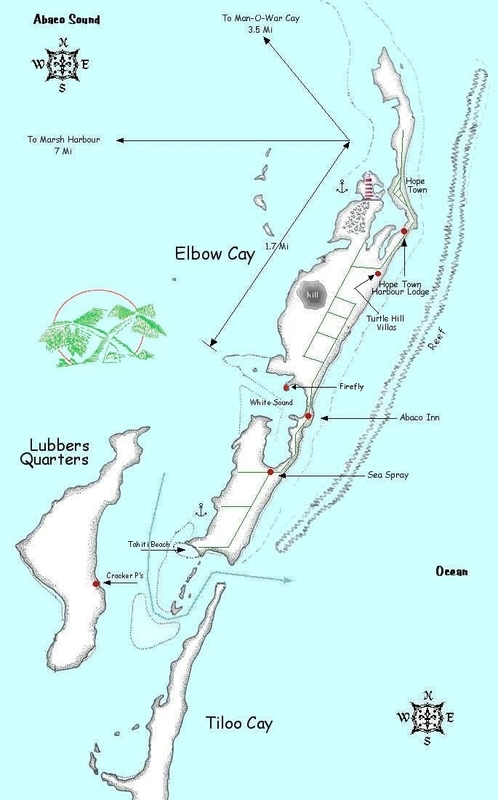 Lubbers Quarters: Across from Tahiti Beach at southwest Elbow Cay lies the island of Lubbers Quarters. If faces the Tilloo Cut, the pass between Elbow Cay and Tilloo Cay the island due south of Elbow. (Map) There is no provisioning of any kind here and one restaurant on the island. You definitely need a boat here as the ferry charges "charter rates", to get you to and from. The good news is it's only a short hop to Hope Town (10 Min. by boat). Daytime only. Lubbers is a small island with a picturesque beach on its western shore and often overlooked by boaters as they head south. And as with every out island, Lubbers too has its popular watering hole - Cracker P's. It is named after a somewhat of an eccentric character of years back. Cracker's is also known for their full moon parties. Food wise, it would be a cheeseburger in paradise of course or their house specialty, coconut marinated conch grilled and served in a pouch. It's a great spot for an afternoon Kalik or dinner on the way back from wherever, or Tahiti Beach just across the way. 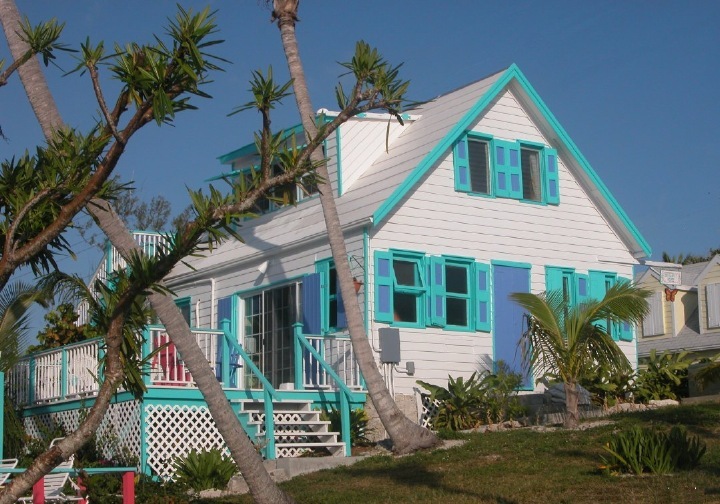 It's perched high and has a great view of the Abaco Sound and it's within walking distance to many of it's rental homes. On Lubbers you will find a mix of old and new homes for rent, many of which are geared for the eco tourist (solar powered with gas stoves and no A/C). But dont let this deter you as lubbers is pretty breezy most of the time - just think of it as a romantic return to nature. One such house that comes to mind Moonrise Cottage owned by local artist Marlee Mason and who is highlighted on our Abaco Art page. Additionally you might want to look into Lubbers Landing, they also describe themselves as an eco-resort offering multiple cottages and boat rentals. David and Patti Hanafourde visited Lubbers Quarters and went absolutely bananas over the island and built their cottage which they nameed, you guessed it, Gone Bananas. And yes they have electricity, with even a backup generator plus Wi-fi and DirecTV. You can say the same about Patti and Eddie Davis' newly refurbished Summerview Cottage. It's been completely renovated after Hurricane Sandy. If you are looking for a different approach to island rental, you might want to consider Watercolours Cottages. 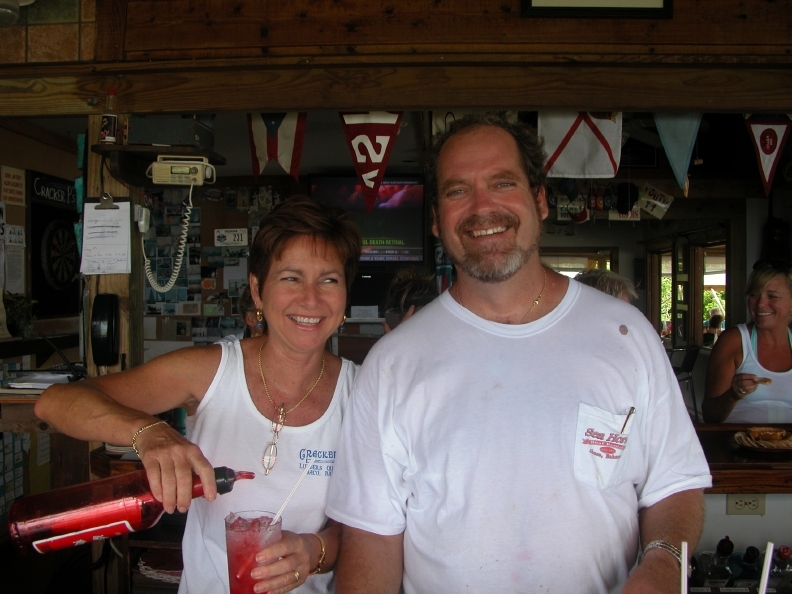 It's run by Mark & Patti Gonsalves and in addition to their cottage, Mark can put you up "afloat" on one of his charter yachts and give you a tour of Abaco only visiting yachtsmen see. And finally if you want to make sport fishig part of your package, check out Pura Vida Cottage -the good life. Still more can be found by visiting our Accommodations & Services Page. Reminder, if you plan to stay on Lubbers you will require a boat for sure. 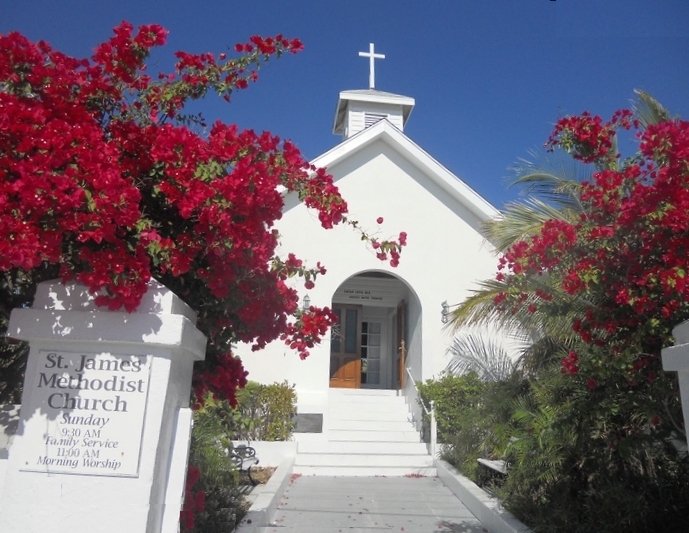 If you're renting a boat and still want to go furthure, just south of Elbow, in the Sea of Abaco, on your left, ocean side you pass a 4 mile long string bean of an island, called Tilloo Cay, the last inhabited Cay of the Abacos. There are quite a few homes here, yet no public access. One resident of some notoriety whom we befriended during an earlier trip, is Brigitte Bower Carey. She too is a resident artist who is also featured on our Abaco Art page. She and her husband moved here in '91 before electricity which only arrived in '98. Telephone followed a few years later and today it's regional WiFi. On Tilloo southern end is a large shoaling area and beach which makes for some great exploration & shell collecting. If it's low tide, go slow here, it gets pretty shallow and you might have to go around the bank, to it's west, to get further south (see Dodge's book). 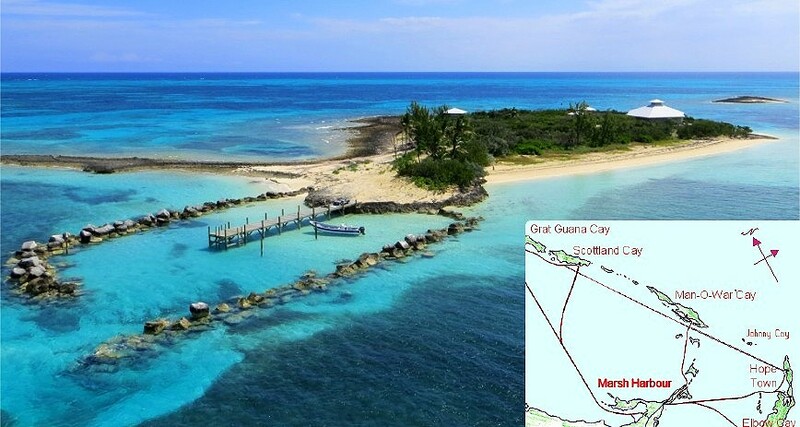 Beyond Tilloo there are three islands referred to as the Pelican Cays. The first and third have lovely white sand beaches as does Tilloo. West of the Pelican Cays and east of Sandy Cay and you'll find Pelican Cays Land & Sea Park, one of many protected underwater parks in the Abacos with its impressive stand of Elkhorne coral anywhere. You'll see the half dozen or so mooring balls provided for small boat tie up. These parks ranging from Walkers in the North all the way down to Little Harbour. As with all these preserves, it is forbidden to remove or kill anything and don't anchor in coral, only on sandy bottom if mooring balls are not available. 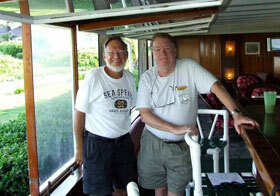 Details and their location are best described in the Cruising Guide to the Abacos. Or you can inquire at any dive shop mentioned. Click here for listing. Motoring southward passing Tilloo, the uninhabited Pelican Cays and Lynyard Cay to ones left on the oceanside, you'll have reached the end of the line, Little Harbour. 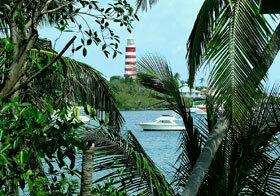 Little Harbour is actually on Abaco's mainland and makes for a great day trip by boat or car from Marsh Harbour. Here you will find the celebrated Pete's Pub & Gallery (& Foundry) a beach bar that serves fish or hamburgers at lunch and sometimes dinner. There is more to be said about Little Harbour, especially when including its neighbor Cherokee. 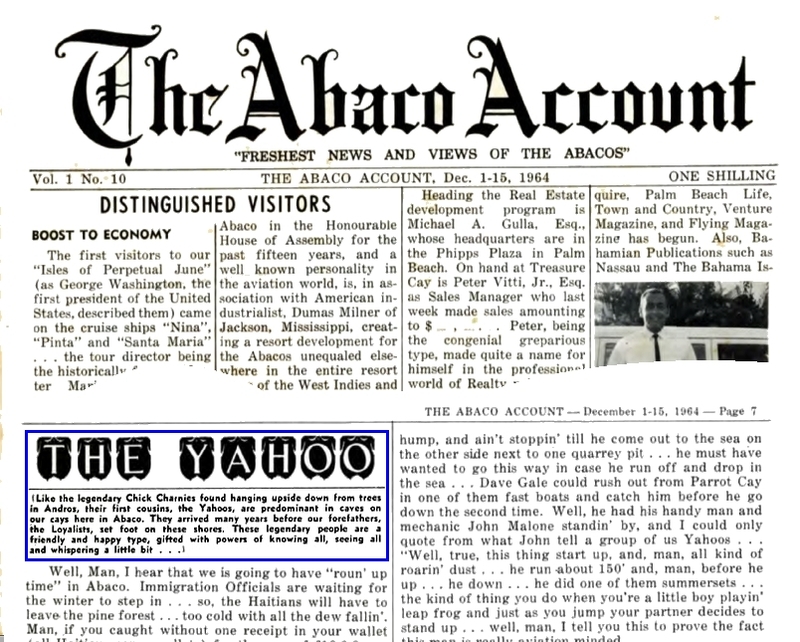 Since both are on Abaco's mainland they are written about in our "South Abaco." section. Local Folklore: There once was a popular watering hole on Lubbers that proceeded Cracker P's. It was named after the legendary Yahoe. Appropriately named Yahoe's Sand Bar, the Bar mysteriously came and went in the late 90's. Some say the bar was destroyed by an unnamed tropical storm. Others say the bar itself plus new home construction on the cay attracted too much attention to the Yahoe's otherwise quiet out island resulting in the destruction of the bar bearing their name. The Island of Andros is said to be the home of the Yahoe (pronounced ya-hoo-ee). In some locations they are called called Chickcharnies. 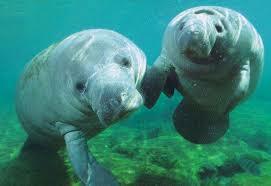 In recent times a pair has been spotted on Lubbers Quarters and other less populated Bahamian Islands. "An 1964 account.". 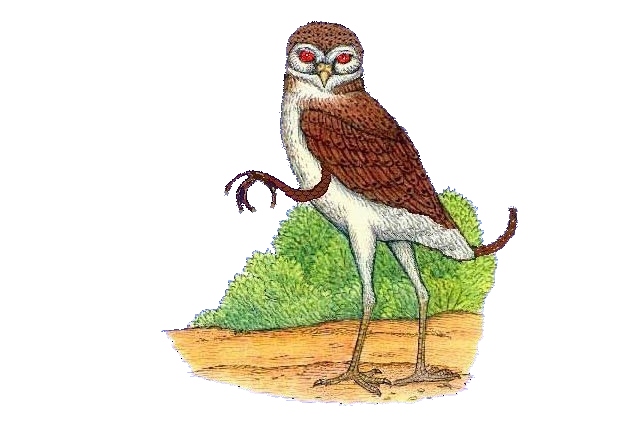 The Yahoe is a, flightless birdlike creatures stand about 3.5 - 4 feet tall and have piercing red eyes, They have four fingers with only one forward toe and three facing backwards. It also has and a monkey like tail, which they use to hang from trees. Yahoe or Chickcharnies live in the thickets and treed areas and build nests by joining trees together at the top. It has an unearthly cry heard at night when all good children are supposed to be in bed. 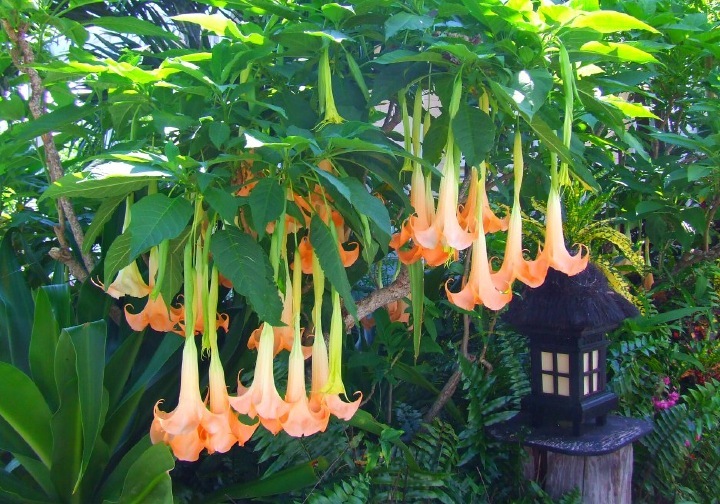 When searching for one, carry flowers or bright bits of cloth with you to charm these mischievous creatures. The Yahoe is said to be generally peaceful when left unmolested. Legend says if you see a Yahoe and show it respect, you'll be blessed with good luck for the rest of your life. Be careful not to sneer at it however, or your head will turn completely around! It has also been known to kidnap people, not releasing them until after they have eaten a bunch of green bananas or sapodillas.